Figures published by Grand Designs Magazine show that investing in energy efficient doors and windows could add up to 22% to the value of your home. It has been recently published that as part of a special supplement on how to make your home lighter and brighter, figures compiled by the Magazine state that new windows, doors and bi-folding doors are a great way to increase the sale value of your property. It says that while adding a new front door could add up to 2% to the value of your home, bi-fold doors could add up to 10%. New windows will add a further 10%, which collectively could mean that new windows and doors could increase the value of your home by almost a quarter! Gary Warby, Director Premier Windows, said: “There’s already a lot research out that suggests that double glazing is a key attribute looked for in a property by prospective house-buyers. “These new figures published by Grand Designs Magazine, suggest that it can be even more important in helping homeowners maximise the return on the sale of their properties. “While there are a number of factors at play, including home security, it suggests that energy efficiency is an increasingly important priority for home buyers. Replacing an existing doors with high performance, thermally efficient composite doors, PVC-U doors or new generation inline sliding patio or bi-folding doors, could save you more than 400 kWh/year per door. Energy efficient double-glazed windows will, in the average three-bedroom semi-detached property, save you an impressive 2355 kWh/year in energy according to Government figures – and that’s per year. In hard cash based on current energy prices that could add up to as much as £160 per annum! 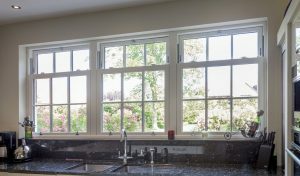 Premier Windows, offer a wide range of thermally efficient double glazed and triple glazed windows and doors. These can be designed sympathetically to match the character of your property. High performance and high security new generation multi-point locking windows and doors will also help to make your home more secure.